I'm ashamed to say it, but this gorgeous reproduction vintagesque first aid box has been sitting on my desk since December. The lovely Gillian from Howards Storage World, sent it over and I planned to do a story on packing a first aide box for Summer, but the state of my first aide cupboard was revolting and I just couldn't go there unless it was an emergency. Have a look for yourself. 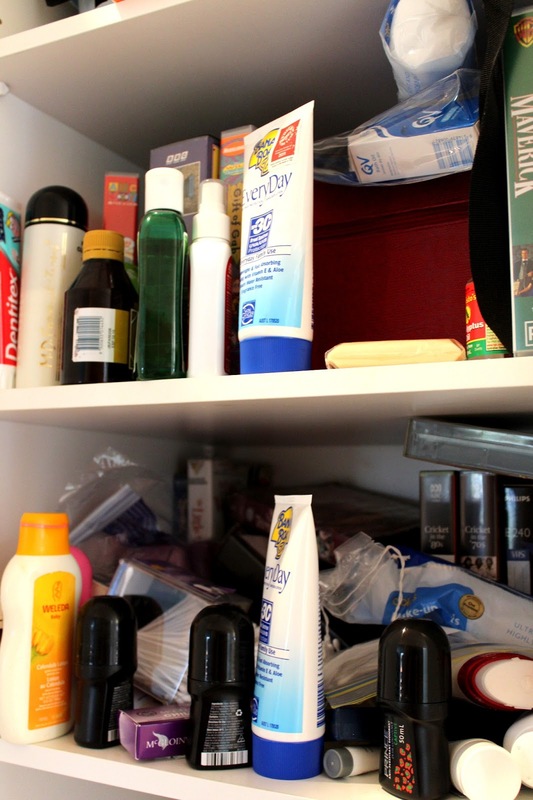 Actually I did go there everyday for a few seconds for deodorant (note the three half used bottles.......embarrassing) and sunscreen, but the thought of organising it, did not appeal at all. What a mess. 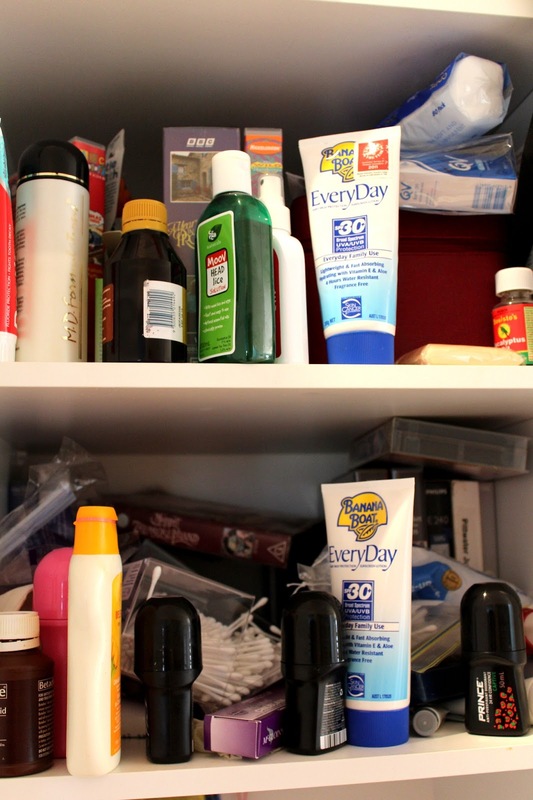 I love a tidy house, but I usually, achieve this by cupboard shoving. So the other day, I bit the bullet and did it. I hauled the washing basket in front of the 2 shelves above the broom cupboard I use to put the toiletries, medicine bottles and some old videos I can't bare to part with. Just as an aside, this is where I stored stuff I didn't want the babies to get at when they were toddling and it has just never made it back into the bathroom vanity. That my friends, is full of towels. I tossed and shortened up and got a lot of the smaller bottles in to the new box. I love the way you can lift the top bit off (it has an inbuilt handle). If you needed to attend your patient in the back yard, you could carry that bit out there on its own. So in here I put band aides, creams, saline solution and sterile wipes, nail scissors and tweezers. It's kind of like a little mobile dressing station I guess. 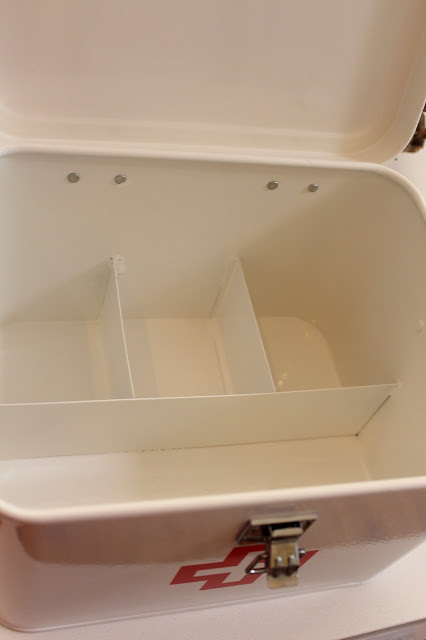 The bottom compartment is where I stored bandages, syringes and a thermometer and some of the smaller bottles like tea tree and eucalyptus oil. And here's how the cupboard looked after my little clean up. Well ultimately this is what it will look like, because right now, I think this box is just too cute to hide in a cupboard, so she is sitting pretty in my bathroom. If you would like the chance to win your own first aide box from Howards Storage World, here's what you need to do. Leave a separate comment for each follow, even if you have for some time. Sharing this to each of your social media platforms will constitute another entry. Leave me a separate comment for each share. You MUST enter the giveaway on this BLOG by leaving a comment here. You do not need to have a Blogger account. Just sign in as anonymous and leave an email address. This competition is open to entrants living in Australia only. This competition is open from now until 1 March 2013 12pm Australian EST. The winner will be announced on this blog, Face Book and Twitter and I will contact you, as long as you have left a valid means. The winner will have 7 days to respond, otherwise the prize will be redrawn. This giveaway is now closed. The winner is Kara Beal. Please contact me Kara, within 7 days to avoid a redraw. Thanks to everyone for joining in. I was not paid to run this giveaway. I was given this lovely box to keep. Beautiful addition to any bathroom. Kayejg. My cupboards are shameful Carolyn. Half-used three year old bottle multiply under my roof. I *am* pretty good with my first aid kit though. We go on a few remote holidays, and a friend once told me "better looking at it than looking for it". So I'm the epitome of preparedness when it comes to first aid (if nothing else!). Wonderful box. Wish I could be part of the giveaway. Please enter me! I follow you on facebook. Love it, love it, want!! I have my stuff in a daggy old plastic box. Oh dear... and it needs a major overhaul. I have been meaning to put a first aid kit in the car for 15 years at least. One day!! I love this storage idea. Unfortunately my cupboard looks even worse than yours. This would be a huge help. I have been following you for a while. Now following you on Pinterest. I love all of your boards. It's so pretty and cute! Thanks for the giveaway :) I follow by GFC as JessS. I already follow you on FB! Love the beautiful box! 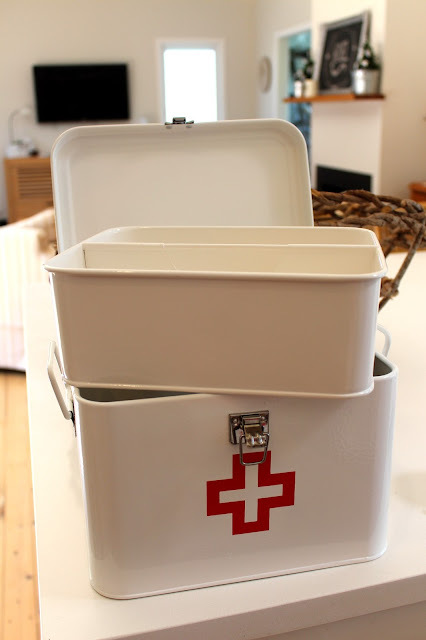 I love the shape of this first aid kit!!! I live in Canada and I'm going to look for one here or in the states this year. Do you know if the company only makes them there in Australia? We have 2 diabetics in my house and I would love to get one this size, then, again maybe I could make it into a project. Thanks for showing me/us this!!!!! I would absolutely LOVE to win this prize! I'm a French girl living in Sydney and I absolutely love the vintage look of this box. It reminds me of backhome, at my nan's place in provence. I found you through my friend Seana Smith and I now follow you on Twitter. 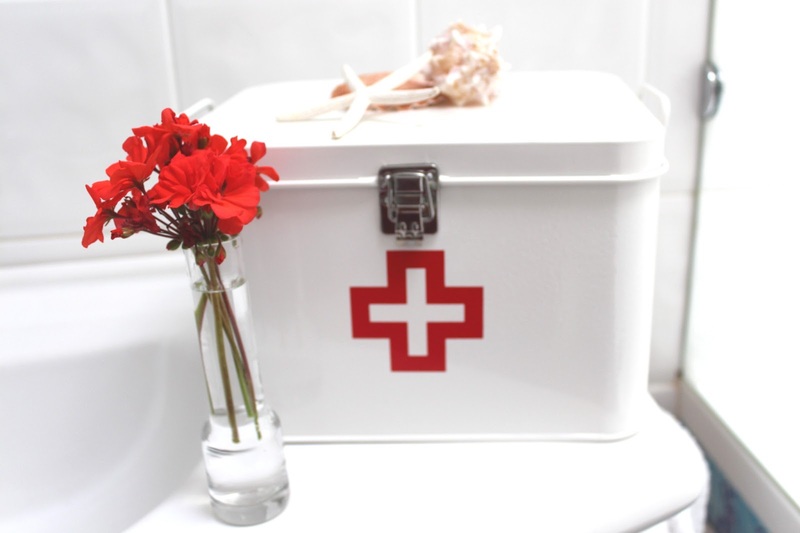 That is a gorgeous medicine box! If I had one it would sure be incentive to clean out (and I mean ruthlessy cleanout)the cupboard that is currently struggling to hold the used, unused, required and why do we even have that items. Following on Google Friends Connect! I love the box and the way you've styled it. You are right it's too pretty to put in the cupboard. Obviously I'm not able to participate because I don't live in Australia, but I just had to leave a comment anyway, because that tin is just so cute! 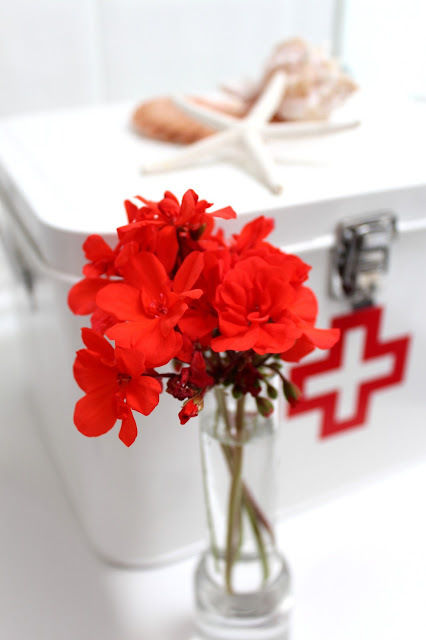 Following you on Facebook - Love this gorgeous & practical First aide box! I would love to win it! I'm following you on Facebook. I could fit so much in this cute little box and it would be easy to spot too. I have shared on facebook also. 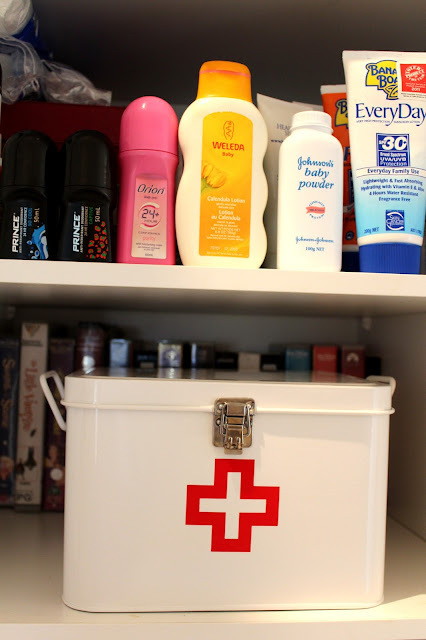 I have to say that I love this first aid kit. I love the style and have a peg bucket in this style. This tin is lovely! It would look great in my laundry! I'm following you on Facebook. Hope I win! Following on Pinterest too, yay! And finally, following on Google+ / added you in my circle! Also shared link on Facebook & tagged Desire Empire! schneko@gmail.com thank you!